Newly arrived Rohingya refugees walk ashore at Shamlapur beach in Cox's Bazar district, Chittagong Division in Bangladesh, after traveling for 5 hours in a boat across the open waters of the Bay of Bengal (7 September 2017). 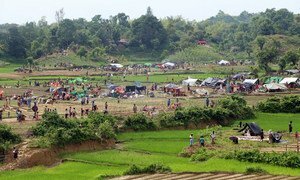 Amid an acute shortage of humanitarian supplies for the thousands of Rohingya arriving every day in Bangladesh, having fled violence in Myanmar, the United Nations Children's Fund (UNICEF) is undertaking a “massive” scale-up of its emergency operations to ensure that those most vulnerable are not endangered further. Up to 400,000 Rohingyas have been sheltering in Bangladesh since violence erupted across the border in Myanmar's northern Rakhine state in end-August and, according to preliminary estimates, about 60 per cent of them are children. “There are acute shortages of everything, most critically shelter, food and clean water,” said Edouard Beigbeder, the head of UNICEF in Bangladesh. In its response, the UN agency has been dispatching trucks filled with emergency water, sanitation and hygiene supplies to Cox's Bazar (located near the Bangladesh-Myanmar border), with a steady stream of supplies in the pipeline for the coming days and weeks. Supplies include detergent powder, soap, and pitchers and jugs for storing water, along with nappies, sanitary napkins, towels and sandals. UNICEF is also supporting the Department of Public Health Engineering with water treatment plants and carriers, and is working with partners on the ground to install and rehabilitate tube wells. “These items are part of a first wave of supplies that will massively scale-up our emergency response to the growing number of Rohingya children in Bangladesh,” Mr. Beigbeder added, noting that UNICEF has appealed for $7.3 million to provide emergency support to Rohingya children over the next four months. Yesterday, speaking at a press conference, United Nations Secretary-General António Guterres reiterated his call on Myanmar authorities to suspend military action, end the violence and recognize the right of return of all those who had to leave the country. He also underscored his call for “an effective action plan” to address the root causes of the situation, which he said had been left to fester for decades and has now escalated beyond Myanmar's borders, destabilizing the region. The flow of desperate Rohingya fleeing across the border from Myanmar into Bangladesh is unprecedented in terms of volume and speed, United Nations humanitarian agencies said today, amid calls for international support for the emergency response.